What is a Digital Microscope? - New York Microscope Co.What is a Digital Microscope? 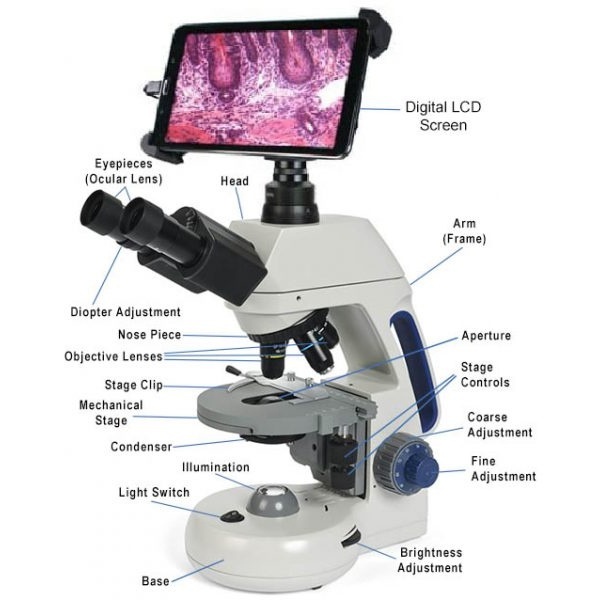 - New York Microscope Co.
Home / Microscopes / What is a Digital Microscope? A digital microscope is a variation of a traditional optical microscope in which a digital/microscope camera is connected, and image output is displayed on a screen and/or monitor. Most models include software and a computer for use. The magnification produced by a digital camera is determined by the size of the monitor an image is displayed on, giving it greater magnification capabilities than the average optical microscope. The power of magnification in a traditional microscope is determined by multiplying eyepiece magnification by objective lens magnification. The ergonomics of using a digital microscope benefit users in every industry who spend hour’s daily working with a microscope. Viewers can sit in a relaxed upright position, with the need to peer through an eyepiece eliminated or greatly reduced. Digital Microscopes can be connected to a computer monitor and then can be projected through an LCD projector to a large screen for audience/conference viewing. Although there are obviously many different types of digital microscopes and purposes for their use, there are some basic parts of a digital microscope. Some optical microscopes are equipped with a digital microscope camera, while some offer HDMI/USB output capability. Many digital microscopes include a digital microscope camera with an LCD screen attachment for displaying images while many others rely on a separate USB computer monitor or HDMI monitor. How Do Digital Microscopes Work? Typically, a digital microscope comes with software that runs on a computer and supports the microscope’s function. With the software, users can see and capture images. Many versions of software also have additional advanced features, including video recording, measuring, anecdote/labeling and photo editing. On some programs, you can magnify and modify images from the digital microscope in multiple ways. Of the many types of digital microscopes available from student to medical and industrial research, handheld units are very popular. They’re portable, easy to hold, and ideal for use on factory floors and for field work in various industries. Biological Digital Microscopes: High magnification biological scopes that are lit from beneath graduated mechanical stage. Objectives range from 4x-100x with halogen or LED illumination. Fluorescence Digital Microscopes: Optical scopes that use fluorescence and phosphorescence as the main source of light for generating images. Inverted Digital Microscopes: Trinocular microscopes with the light source and condenser on top of the stage that are available in metallurgical, brightfield, and phase contrast configurations. Metallurgical Digital Microscopes: Scopes designed to view metal surfaces, circuitry, or any opaque surface. Phase Digital Microscopes: Inverted or upright microscopes designed to view unstained specimens that are alive or dead. Polarizing Digital Microscopes: These microscopes use polarized light to force light wave vibration in a single direction. This allows you to evaluate three-dimensional structure & composition of anisotropic specimen. Stereo Digital Microscopes: Typically reflect light off specimen rather than shining it through them. Ideal for viewing electrical components, circuitry, plants, art, and artifacts. Digital USB Microscopes: Digital microscopes is where the camera is dedicated to the microscope. The digital camera is permanently attached & not able to be removed. Digital Microscope packages are digital microscope cameras that can be removed from the microscope they are connected via c mount adapter. Handheld Digital Microscopes: New wave of digital cameras that are integrated into a small, handheld microscope system. Used in applications such as surface inspection and forensics. Portable Digital Microscopes: Small and often with wireless capabilities, portal digital microscopes are ideal for viewing hard-to-reach surfaces and typically used for medical purposes, field inspection, and dermatology applications. Digital microscopes are game changers in research, education, medicine, industry, and many other trades and businesses. In education, for example, entire classes can now view specimens at once. This provides students with consistent learning experiences. Portable or Handheld Digital microscopes can also help: Beauticians identify skin problems; veterinarians identify and remove ticks; horticulturalists identify plant diseases; professionals in art restoration; in forensic analysis, for identification of forged signatures; and much more. « What is a Stereo Microscope?